This blog post I am about to link to is rather tongue in cheek, and in no way reflects my feelings toward our beloved clients. It is however very representative of the types of prospects we see everyday. Thankfully our clients are not like this, because we only take on work from good folk that understand the value of our services. If I had a nickel for every time I heard #1, I would have retired many years ago. Be a good client, your web designer will love you for it. Read: Nightmare web design clients. I will follow up with the clients perspective one of these days to be fair. This entry was posted in Oblog, Web of Interest on May 23, 2007 by Joshua Strebel. Web 2.0 Design hurting users? In a recent article I found on Digg, Jakob Nielson attempts to make the point that current design trends with all their promise are actually hurting users. I have to agree with this statement.Â Many sites are simply high on “cool” and low on substance.Â If you have used Myspace, you know how terrible it is from a UI perspective.Â But lets not through the baby out with the bath water. We have gone through a few iterations of bestpartyever.com, the first of which was a showcase in cool web2.0 UIÂ and browser tricks.Â We made the mistake of focusing on the cool over the actual use of the website, which is to plan parties. However that iteration was key to our development plan as we were testing new methods of organizing and displaying data [read innovation]. These new websites like flickr, facebook, twitter, etc. are the leading edge of web application development.Â In an effort to push web applications to resemble a desktop application with the same ease of use familiar to many, web design firms have to explore new ground in website design. Again I agree. Yet with today’s “launch early, launch often” mantra in web development, sometimes the basics in the traditional sense do not apply.Â Mapping out a multi-layer UI for some new world changing whiz-bang website simply cannot follow the existing mold. What’s it mean? Don’t forget that the user is still the most important stake holder in the website design equation.Â Creating an interface that is easy to use is paramount, yet trying to apply old standards to new technology may not work as Mr Nielson is trying to do.Â Also there is an air of web2.0 backlash going around that always happens whenever a trend hits the peak of the adoption curve. This entry was posted in Oblog, Web of Interest on May 14, 2007 by Joshua Strebel. 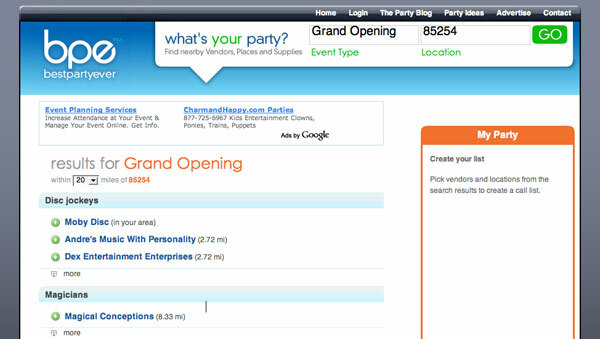 So our little project BestPartyEver.com is moving forward in a big way.Â Just in case you dont know what it is, BestPartyEver.com is an online party planner that will help you plan your next party. We have come to an agreement with some local talent and will be executing our phase 2 plan.Â The additions to the website over the next 6 months will be fairly significant and really add value to our special event advertisers and users.Â Keep and eye on the website over the next few months as we re-define what you know about event planning. This entry was posted in Oblog, Web of Interest on April 29, 2007 by Joshua Strebel. Proud to announce our little project: The Flare9.com website builder system is open for business. This entry was posted in Oblog, Web of Interest on March 7, 2007 by Joshua Strebel. We have been plugging away for about 5 months on our new website builder application, Flare9.com. Flare9.com is a simple and easy to use website builder that will allow you to create your own website without hassle. Built upon WordPress 2.1, flare9 has automated the hosting, domain registration, site install and setup process, to create a website in a matter of minutes. And the best part is, We (obu) have designed the website templates so it is virtually impossible for the customer to build an ugly website. Well almost impossible. The go to market strategy of flare9.com is thus: Medium and large web design agencies simply cannot serve low cost clients (-$3000) effectively. Therefore the client leaves unhappy and the firm looses out on potential revenue. We are targeting these web design agencies as affiliate partners to refer these low-yield clients to flare9.com for a referral fee. The agency makes money, flare9.com makes money, and the client gets a great professional website they can edit themselves within their budget. Everybody wins. Flare9.com is entering beta this week for a 2 week final testing cycle before an official launch early March. This entry was posted in Oblog, Web of Interest on February 16, 2007 by Joshua Strebel. Preface: Increasing exposure of an existing online asset is tough, almost as tough as getting that first market push for a new business underway. For much of the last 10 years Search Engine Optimization (SEO) was loosely defined as: optimizing your website content (verbiage, Meta data, naming conventions) for maximum keyword relevancy, and the procurement of relevant incoming links. English: Make sure your website content is relevant to the topic, and get people to link to you. If you packed in enough keywords, and built enough links (quantity) regardless of quality, rankings came easy. Fast forward to today. SEO is about TRUST, and Trust shall set you free. It is still very important to optimize your content and ensure that you are utilizing on page factors for building relevancy. But now SEO is really a game of trust. For a website to rank well, it needs to be deemed trustworthy. TrustRank as it is sometimes called is a way of assigning value to a website, the higher the value, the higher it will rank. â€œPageRank is to The Bubble Up Theory as TrustRank is the Trickle Down Theory. Google chooses [x] number of sites it trusts as a seed, and let’s the TrustRank flow down through other sites via on page references (links)” says Chris Hooley, a leading name in the SEO field. â€œThink of links as cash. Link Equity. Now think of them in light of those two ways economists look at the flow of cash. You need to accumulate lots of links to PUSH your market position up, and you need to collect big, fat, trustworthy, important links to PULL your market position up. Links can be viewed as currency, and link marketing is no different than brand marketing. It’s just the way we measure the effectiveness that differs. Gaining market share, or gaining link share.â€? So according to Chris, building trust is the golden chalice of top search engine rankings. So how does one go about getting these links from trusted sites? Enter stage left: Linkbaiting. Odd word but very important concept. Iâ€™ll let link guru Todd Malicoat define it. â€œLinkbaiting is all about the bait. In the same way that you canâ€™t catch a giant tuna with a bag of Doritos – youâ€™re not going to get the attention of important bloggers, journalists, or other folks with some garbage content or news.â€? What Todd is saying is simple: write/publish something worth linking to. He goes on to describe â€œLinkbait Hooksâ€? or methods to present information that can be used to attract the attention of a link happy audience. So how does this all work for the average small business in Middle America in need of website traffic? Stay tuned for Part Deux for the answer. Author: Joshua Strebel – President Obu Web Technologies a leading web design agency. This entry was posted in Articles, Oblog, Web of Interest on January 29, 2007 by Joshua Strebel. 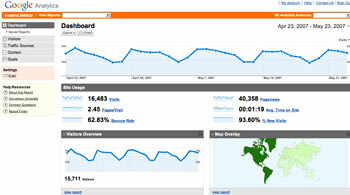 Man people really like our website.. This is the 7th person to “borrow” it. And this guy is apparently a reality TV star. here. This guy is sooo cool. He must hang out with Kathy Griffin on the D-list. This entry was posted in Oblog, Web of Interest on January 27, 2007 by Joshua Strebel.